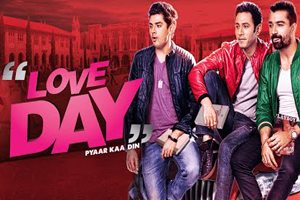 Love Day - Pyaar Ka Din is a 2016 Hindi Comedy Drama film based on Friendship directed by Harish Kotian and Sandeep Choudhary. The film is produced by Baldev Singh Bedi. The Movie features Ajaz khan, Sahil Anand, Harsh Nagar and Shalu Singh in the lead roles. The music of "Love Day - Pyaar Ka Din" is composed by Sagar Sarkar, Vicky Hardik, Raina Sawan, Vishnu Narayan, Sumesh Himanshu and lyrics are penned by Ravi Babu, Hardik Acharya, Raina Sawan, Saani Aslam, Sumesh Himanshu. Here is the link of all the songs lyrics and videos of Love Day - Pyaar Ka Din.